Matelita Tuilevuka left her home in Suva, Fiji, to chase a dream of her own. As soon as she heard about the CrossCoders Program last year, ‘Martz’ was inspired after cutting her teeth in the game of Australian Rules football playing for the local Suva Cats. David Lake has been appointed Senior Coach of the Gold Coast SUNS’ inaugural AFLW side. The appointment comes hot on the heels of the club announcing its first three AFLW player signings. An influential coaching figure in Queensland football over the last 15 years, Lake has coached Mt Gravatt and Morningside in the state league, as well as representative duties coaching Queensland, Papua New Guinea in the AFL International Cup and the first Gold Coast SUNS women’s representative team that played the Brisbane Lions in 2016. Lake joins the club from the Brisbane Lions AFLW team where he has been their midfield coach since 2016. Club founder, Elliott Takolu, is proud of his footy team. 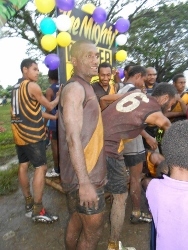 The Salamander Power club is based in Lae, north of the Papua New Guinea capital city of Port Moresby, and operates within its own small league – AFL Lae - well out of the glare of the rest of the football world. Whilst it is known to some that footy is played as far and wide as Iceland, Chile, Myanmar, Uganda and many other exotic, far flung nations, this club which is close to Australia’s doorstep is almost anonymous. In a rare opportunity to chat with a club president of a club from New Guinea, a fascinating account of growth and regrowth emerges. In the process, West Eagles boss, Alois Melua, gives us a small window into how a club operates in the shadow of other stronger codes in Port Moresby. Alois started playing Australian Rules football in 2010. He played for several clubs in Port Moresby, starting with the Uni Tigers -the club managed by his late cousin and key figure in local PNG footy, Peter Meli. 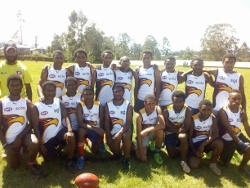 In 2017, Alois was with the Koboni club and joined the Eagles in 2018. 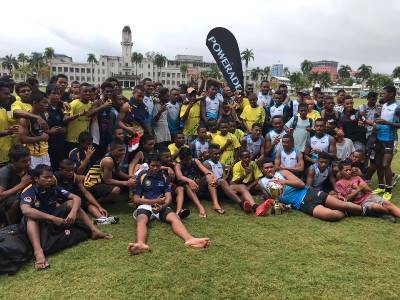 The Fiji Tribe successfully defended their Oceania Cup this year, taking home the goods after a thrilling weekend of U15 footy in the nation’s capital of Suva. Playing against highly competitive sides such as the Nauru Stars, the Vanuatu Volcanoes and the South Pacific All-Stars, the Tribe finished the tournament with a flourish and will look to build upon their performance in the new year. The first day, December 3rd, featured lightning cup-style matches between the Tribe and the Pacific All-Stars, which were made up of players from Tonga, Fiji and the Solomon Islands. The Tribe’s defense held strong in the contest. The hard-working Tribe were a bit inaccurate on goal, but they ensured that every possession was hard-fought in the midfield. Simione Kaivei led the way with two goals, while emerging Inia Rabuka was influential around the contest and earned best on ground honors for his efforts. In the end, the Tribe won by a score of 5.7.37 to 2.0.12. There are many doubters and naysayers about Australian Football outside of Australia. That's a given. Most people I speak to have little idea of what is going on in New Zealand and glibly suggest all AFL ventures there to be a waste of time. However, 2 months back, Mitch Powell and Louis Herman-Watt in their edition number 28 of their 'Stoked Podcast' via the NZHerald had the task of reviewing the sporting week. The first Oceania graduate to crack it for a senior AFL match and senior listing - Kiwi Kurt Heatherley - has not been offered a contract for 2019 by the Hawthorn Football Club. Kurt came through the AFL Oceania and South Pacific pathway before relocating from New Zealand to Melbourne and completing his schooling at Caulfield Grammar. Five years ago as an 18 year old he accepted an International scholarship offer from Hawthorn and as reported at the time by Emma Quayle (the Age) he was set to become one of the most (internationally) travelled AFL players. Prior to the 2016 season Kurt was upgraded to the Hawks senior list, and in round 20 of 2016 made his senior debut against Melbourne at the famous MCG in front of a tick under 39,000 fans. In 2017 a further 4 games followed - twice versus Collingwood (over 50K each time) and a trip to Tasmania for a draw against the Giants at York Park in Launceston; before a last senior hit out against Geelong in a 3 pt loss in Round 17 of 2017 in front of 70K at the MCG. Injuries hampered his progress, this year with a only 2 VFL games prior to June and unfortunately after a solid stretch through winter he succumbed to a hamstring injury in August that ruled him out of the successful Box Hawks finals campaign. Highlights included his debut against Melbourne and first win Round 15 2017. 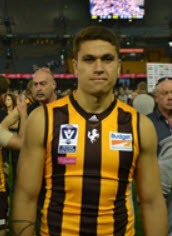 After beginning his time at the Hawks during their golden era of the 2013-15 three-peat; in more recent times other players have moved ahead of him in the Hawthorn backline. Hopefully though he might find another home in the AFL and wouldn't be a bad fit at a number of clubs. Shem Tatupu targets 2020 IC. September 2015 and the Box Hill Hawks went down in the VFL Grand Final at Etihad Stadium. I was reporting that day for WorldFootyNews because of the presence of Kurt Heatherley and Shem Tatupu - 2 NZ products who had made it to the cusp of the big time in footy. For Heatherley - a sprinkling of (5) AFL games for Hawthorn since then - a lack of opportunities in 2018, in part due to injuries in the first half of the season - is finishing off solidly with the Box Hill Hawks. For Tatupu - after that loss at Etihad - his career took a U-Turn as he quit the Hawks and tried his luck at Melbourne Storm (Rugby League). 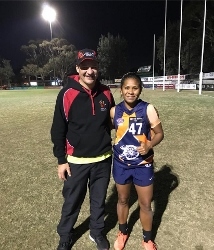 PNG young gun Hewago Paul 'Ace' Oea was recently signed by the Gold Coast Suns to an International Scholarship giving the club first rights to sign the footy prodigy at the 2019 AFL Draft. The AFL Academy listed Oea starred for PNG at the 2017 International Cup and was named best on ground in the Grand Final at the MCG. The following video is from the Gold Coast Suns telling of Ace's time at the club so far. AFL Academy punish NZ late in ANZAC clash. Westpac stadium in Wellington has hosted a big day of footy with the AFL NZ team taking on the highly talented AFL AIS Academy squad. The curtain raiser was the NZ girls against the touring Mornington Peninsula Junior Football League girls side in a follow up to their Sunday morning first instalment. Following on from their 4.9.33 to 1.0.6 win on Sunday morning - the NZ Youth Girls backed up with a 3.6.24 to 1.6.12 win. The senior AFL NZ line up included a number of familiar faces from the IC17 squad along with some new comers. Debutant Dean Staunton scored the first behind for the Hawks.